Winter themed Impression Obsession craft die featuring a snowflake. Winter themed craft die featuring a Snowflake Flower Corner. Winter themed craft die featuring a Snowflake Flower Swirl. Approximately 1.9 x 1.9in. This beautifully vintage collection from Couture Creations and Sue Smyth features an amazing selection of colours and illustrations of ideallic flora and fauna perfect for rustic Christmas scrapbooking pages, cards and off the page craft projects this year! Christmas themed craft dies from Sara Davies featuring snowflakes. Winter themed Penny Black die featuring snowflake frames. Winter themed craft die featuring a border of snowflakes. Pretty and innovative cutting dies to help you create beautiful cards, scrapbook pages and other handcrafted projects! Can be used with most die cutting machines. American Crafts-Cards With Envelopes: Snowflake With Gold Foil. Send these fun holiday cards to your family and friends! This package contains eight 5x7 inch cards and eight envelopes. Acid free. Archival quality. WARNING: This product contains chemicals known to the State of California to cause cancer, birth defects or other reproductive harm. Do not mouth or chew. Imported. Winter themed craft die featuring Snowflakes. Steel cutting die from Elizabeth Craft Designs. Compatible with most leading die-cutting machines. Christmas themed craft die from Sara Davies featuring a single snowflake. Shapeabilities Charming Snowflake Doily Etched Dies A Charming Christmas Collection by Becca Feeken is a six piece set centered around a lovely doily shape inspired by snowflakes with its outer rim die. It also includes two charms and a snowflake accent piece that can be place in the center of doily. Approximate size: Star Charm: 1.20 x 1.25 in 3.00 x 3.20 cm, Snowflake Charm: 1.20 x 1.35 in 3.00 x 3.40 cm, Bell Charm: 1.25 x 1.35 in 3.20 x 3.40 cm, Snowflake Inner Rim: 1.80 x 1.80 in 4.60 x 4.60 cm, Snowflake: 4.00 x 4.25 in 10.10 x 10.80 cm, Snowflake Outer Rim: 4.50 x 4.75 in 11.40 x 12.10 cm. Festive Collection - Bold Snowflake Frame. 5 dies. Size: 3.74" x 3.82". Sue Wilson Dies - Festive Collection Snowflake Edger. Craft Dies by Sue Wilson are an elegant collection of high quality steel designs designed to co-ordinate with each other. Decorate your Christmas cards and layouts with this snowflake edger. Size approx 4.75" x 3.25". With steel-rule construction, a Bigz die cleanly cuts thick materials including cardstock, chipboard, fabric, foam, magnet, leather, metallic foil paper and sandpaper (in limited use). Its wider size offers more design options. Designed for use only with the BIGkick, Big Shot and Vagabond machines and requires a pair of Cutting Pads. Winter themed craft die from Tim Holtz and Sizzix featuring a snowflake. Thinlits create dazzling detailed shapes for more creative cardmaking and papercrafting projects. These wafer-thin chemically-etched die sets are designed to cut, emboss or stencil a single sheet of cardstock, paper, metallic foil or vellum. They are simple to use, compact and portable for cutting at home or on the go. Use them for enhanced intricacy and to add a special touch of inspiration to all your projects. The Thinlits dies in this set are compatible with the BIGkick, Big Shot and Vagabond machines. 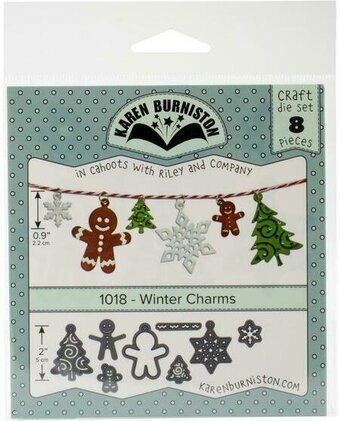 Craft dies featuring a Christmas Tree, a Gingerbread Man, and a Snowflake. Karen Burniston dies will give an added touch to any paper project and are compatible with most die-cutting machines. Winter themed Memory Box craft die featuring snowflakes in a square frame. 100% steel craft die from Memory Box. For use on cardstock, felt, and fabric. Cut, stencil, emboss, create. Use in most leading die cut systems. Penny Black Die featuring six delicate snowflakes. Frantic Stamper Precision Die - Alpine Snowflake. The Alpine Snowflake measures 3" from end to end. 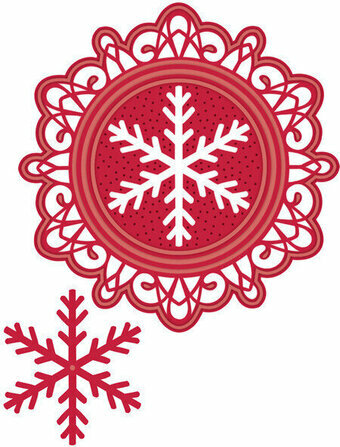 The design cuts out a snowflake with circle openings for a unique slender style. Inside each circle, we were able to nest a smaller snowflake which will automatically fall out when you cut the die.... BONUS! Or, you can place the little snowflake circles back into the main snowflake to fill it in. This gives you a couple different ways to use the die. This beautiful slender design matches so well with our Slender Peace and Joy die (FRA10344). Our Frantic Stamper Precision Dies work in most consumer table top die cutting machines such as the PressBoss, Cuttlebug, Big Shot, vagabond, Boss Cut, and Grand Calibur. Some dies may require the use of a metal shim depending on your machine. Frantic Stamper Precision Die - Chamonix Snowflake. The Chamonix Snowflake measures 3" from point to point. This die is part of a set of three snowflakes that layer together for dimension. The other two snowflakes are the Luchon Snowflake (FRA10317) and the Courchevel Snowflake (FRA10318). Our Frantic Stamper Precision Dies work in most consumer table top die cutting machines such as the Cuttlebug, Big Shot, vagabond, Boss Cut, and Grand Calibur. Some dies may require the use of a metal shim depending on your machine. Christmas themed craft die featuring snowflakes and the sentiment "Season's Greetings". All of the CottageCutz metal dies are universal, easy to use and add great detail to any craft project. They are compatible with most brands of die-cutting machines. Adapters and shims may be required on some machines. Use with paper, cardstock, vinyl, vellum, adhesive-back paper and more. Made in the USA and 100% lead-free. Craft die featuring Winter snowflakes. CottageCutz are thin metal dies, like a QuicKutz. They are easy-to-use and add great detail to any craft project. They are compatible with most brands of die-cutting machines. Adapters and shims may be required on some machines. Use with paper, cardstock, vinyl, vellum, adhesive-back paper and more. Made in the USA and 100% lead-free. Christmas themed craft die featuring a frame with snowflakes. This Die-namics coordinates with the Snowflake Splendor stamp set for perfectly sized die cuts every time. It is open inside to allow you to stamp then cut OR cut then stamp. This feature makes the Die-namics lighter weight and allows for easier removal from the die. 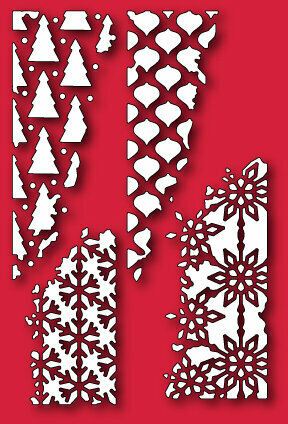 This 5 piece set includes snowflakes measuring: 2 3/8", 2 1/8", 1 5/8", 1 1/8", 7/8". MFT Die-namics dies are our very own EXCLUSIVE, American made line of steel dies. Xcut boasts a comprehensive range of designer dies, all made from the highest grade carbonised steel and are tested to deliver a superior cut. Winter themed craft die featuring a Floral Snowflake. The Frosty Snowflake is a 6-pointed branch snowflake measuring 2" in diameter. Mix and match it with our Crystal Snowflake (FRA10041) and our Snowflake Trio (FRA10043) for a wintery mix. Christmas themed craft die featuring a snowflake border. Pretty and innovative cutting dies to help you create beautiful cards, scrapbook pages and other handcrafted projects! Can be used with most die cutting machines. Joy! Crafts Die - Christmas Tree with Snowflakes. Create lovely Christmas projects using this festive Christmas tree die. Size: 3.5" x 3.75". Winter themed craft die featuring a circular frame with snowflakes. Pretty and innovative cutting dies to help you create beautiful cards, scrapbook pages and other handcrafted projects! Can be used with most die cutting machines. Frantic Stamper Precision Die - Luchon Snowflake. The Luchon Snowflake measures 3.25" from point to point. This die is part of a set of three snowflakes that layer together for dimension. The other two snowflakes are the Chamonix Snowflake (FRA10316) and the Courchevel Snowflake (FRA10318). Our Frantic Stamper Precision Dies work in most consumer table top die cutting machines such as the Cuttlebug, Big Shot, vagabond, Boss Cut, and Grand Calibur. Some dies may require the use of a metal shim depending on your machine. Craft die from Memory Box featuring 4 snowflakes. 1.2 x 1.4, 1.2 x 1.3, 1 x 0.9, 0.6 x 0.7 inch; 3 x 3.6, 3 x 3.3, 2.5 x 2.3, 1.5 x 1.8 centimeters. 100% steel craft die from Memory Box featuring a frame of winter snowflakes. For use on cardstock, felt, and fabric. Cut, stencil, emboss, create. Use in most leading die cut systems. Christmas themed craft die from Memory Box featuring Christmas Trees, Christmas Ornaments, and Snowflakes. For use on cardstock, felt, and fabric. Cut, stencil, emboss, create. Use in most leading die cut systems. 1.3 x 2.5, 1.4 x 3.7, 1.3 x 3.8, 1.4 x 3.3 inches. Craft die from Memory Box featuring a snowflake. 1.8 x 2.1 inches, 4.6 x 5.3 centimeters. 100% steel craft die from Memory Box featuring a burst of snowflakes. For use on cardstock, felt, and fabric. Cut, stencil, emboss, create. Use in most leading die cut systems. 100% steel craft die from Memory Box featuring an elegant snowflake oval. For use on cardstock, felt, and fabric. Cut, stencil, emboss, create. Use in most leading die cut systems. Craft die from Memory Box featuring 3 snowflakes. 2 x 5.6 inches, 5.1 x 14.2 centimeters. Craft die from Memory Box featuring a snowflake in an oval. 2 x 2 inches, 5.1 x 5.1 centimeters. 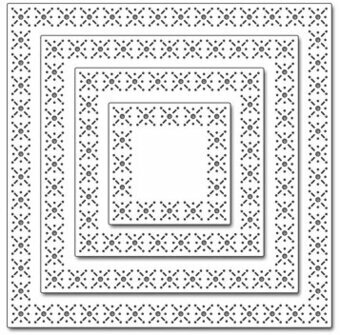 Nellie's Choice - Multi Frame Die Set- Snowflake Circle Edge. A 6 piece decorative die set. Perfect for frames and layering on your festive or winter-themed cards/layouts. Sizes: Smallest: 1.5" x 1.5", Largest: 4.5" x 4.5". Craft die featuring a snowflake on a ribbon. Memory Box/Poppy Stamps craft dies are made of 100% steel. For use on cardstock, felt, and fabric. Cut, stencil, emboss, create! Use in most leading die cut systems. Winter themed craft die featuring a ribbon of snowflakes carried by the breeze. Memory Box/Poppy Stamps craft dies are made of 100% steel. For use on cardstock, felt, and fabric. Cut, stencil, emboss, create! Use in most leading die cut systems. 5.6 x 1.9 inches. 14.2 x 4.8 centimeters. Poppy Stamps craft die featuring snowflakes. 2.8 x 3.9 inches, 7.1 x 9.9 centimeters. Frantic Stamper Precision Die - Reverse Snowflakes Panel. Approx size: 5 inches x 3.75 inches. NOTE: This is a REVERSE CUT die, meaning it will cut the snowflakes OUT of a card front.